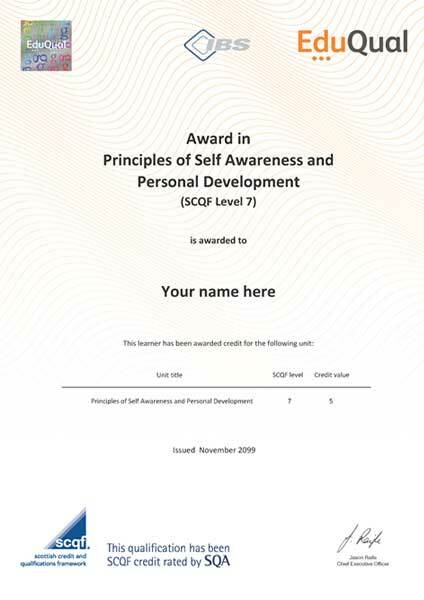 The Award in Principles of Self Awareness and Personal Development (SCQF Level 7) is a 5 credit size qualification with one unit and is a Regulated Qualifications Framework (RQF) equivalent Level 4 award. This award focuses on the importance of being aware of how we behave and appear to others, as seld awareness is an important first step in personal development. It introduces some of the skills and techniques that are available to managers and employees that will greatly assist their own and importantly their team's personal development.